In the mood for a lighter, healthier version of a bacon, lettuce and tomato sandwich? Then do try this one! It is similar to a BLT, but I love spinach. 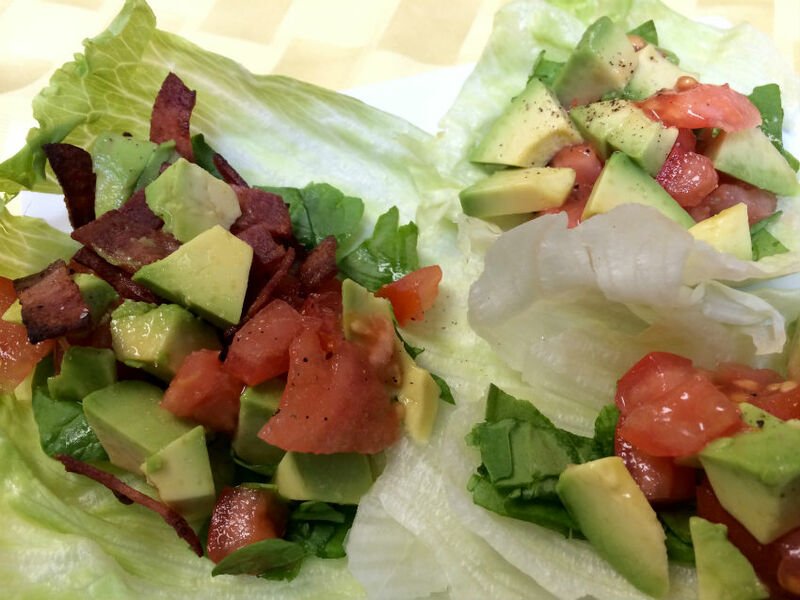 So instead of the traditional blend, I tossed together baby spinach leaves, chopped tomato and avocado with some crispy bacon slices for a scrumptious wrap. The flavors go beautifully together. It’s now a favorite. Whether in a wrap or a sandwich actually. Spinach is a super food for nutrition. Good for both body and brain health. Plus it tastes as wonderful with the bacon and tomato. 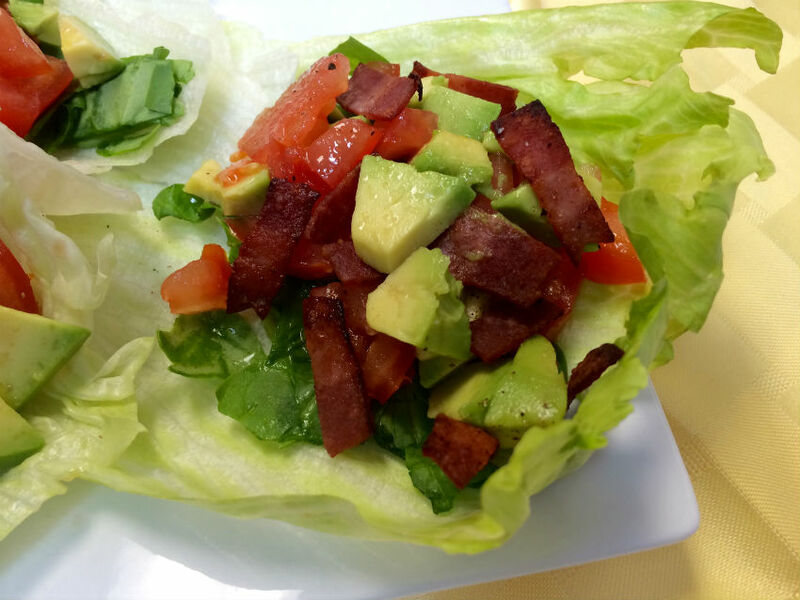 Avocado seems to belong with tomato and bacon–it is the perfect accompaniment. A little sea salt or lemon juice and you have a light satisfying wrap. I often use turkey bacon for mine as well to avoid some of the fat in regular bacon. Either way it tastes great. Would you call it a BLT Light? Perhaps. BLTs are always a popular sandwich choice. Actually, even many vegetarians weaken when they hear the word “bacon.” Why do we find it so irresistible? But as we all know it’s not an especially healthy choice. That is what makes this recipe a good choice. It doesn’t take very many chopped pieces of bacon to provide a lot of flavor. Using lettuce instead of bread offers compromise and removes the calories and carbs bread contains. To lighten it up further, I use turkey bacon. To increase its nutrient value, I use spinach instead of lettuce. For a healthy fat (also good for brain health), diced avocado is included. Use vegetarian bacon or leave it off completely for a Veggie wrap this is still delicious. Prefer a salad? All it needs to make it more of a salad instead of a wrap is some additional greens. To me, it doesn’t even need dressing. The flavors blend to a lovely taste with just a bit of salt and pepper. It’s a new favorite for me, and when put to a vote, it held the lead as well. Clean and dry lettuce, then set aside. Slice uncooked bacon into ½ inch pieces, then cook on medium heat until crisp. Drain and cool on a paper towel. On each piece of butter lettuce, place a portion of chopped spinach. Combine the bacon, tomato and spinach mixing gently, fold in the avocado. Then place a scoop on each lettuce leaf.